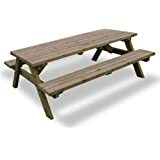 Rutland County Garden Furniture PUB STYLE PICNIC TABLE BENCH - 6FT - HEAVY DUTY - HAND MADE - RUSTIC BROWN - PRESSURE TREATED!! 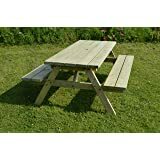 Rutland County Garden Furniture EXTRA CHUNKY PICNIC TABLE - PUB STYLE BENCH - 6FT - GREEN - VERY HEAVY DUTY - HAND MADE IN THE UK - PRESSURE TREATED!! 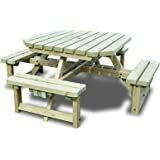 Rutland County Garden Furniture OAKHAM PICNIC TABLE AND BENCH SET - PUB STYLE BENCH - 6FT - HEAVY DUTY - HAND MADE - LIGHT GREEN - PRESSURE TREATED!! 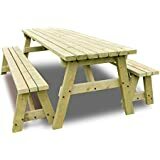 Rutland County Garden Furniture JUNIOR WHITWELL CHILDREN'S PICNIC TABLE - OCTAGONAL - 8 SEATER - LIGHT GREEN - HEAVY DUTY - HAND MADE IN THE UK - PRESSURE TREATED!! 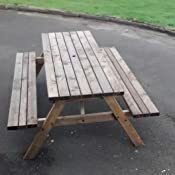 Rutland County Garden Furniture TINWELL PICNIC TABLE - 6FT - BROWN - HEAVY DUTY - HAND MADE IN THE UK - PRESSURE TREATED!! 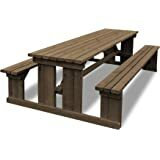 OAKHAM PICNIC TABLE - PUB STYLE BENCH - 4FT - HEAVY DUTY - HAND MADE - RUSTIC BROWN - PRESSURE TREATED!! 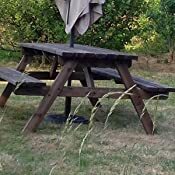 This item Rutland County Garden Furniture PUB STYLE PICNIC TABLE BENCH - 6FT - HEAVY DUTY - HAND MADE - RUSTIC BROWN - PRESSURE TREATED!! 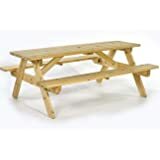 Our range of picnic benches and 8 seater benches (excluding the Ashwell model) are manufactured in our workshops from superior, heavy duty joinery grade redwood timber that is sourced from responsibly managed forests and very seldom seen at this price point. 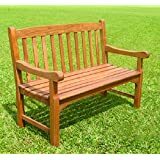 The timber is fully pressure-treated for maximum durability (up to 15 years free from rot or fungal attack) and are strong, robust, highly durable, comfortable and beautifully finished. 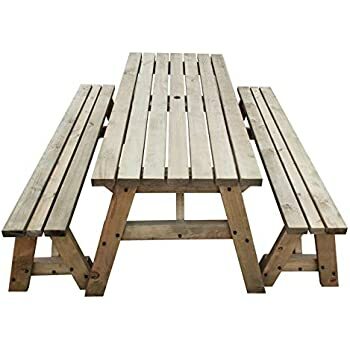 All of our furniture also comes supplied with corrosion treated fixings and black cover caps to maximize safety and further enhance the look of the finished product. Each Rutland County picnic bench also features a convenient 45mm parasol hole size and is semi assembled upon delivery, only requiring a 10mm socket/spanner to assemble. A printable PDF instruction manual will be supplied via email. Standard delivery is to mainland England and Wales only. If you require delivery to Scotland, the following postcodes will incur an additional £25 surcharge and cannot be processed without prior arrangement. AB31 - 56, FK 19 - 21, Any IV postcode, KW 1 - 14, PA 21 - 40 and PH 8, 9, 15 - 40, 49 - 51. In addition, delivery to the following postcodes will be charged at a higher rate and cannot be processed without prior arrangement: IM1 - 9, PO30 - 41, ZE, KW, HS, BT, TR21 - 25, EX39, KA27 - 28, PO boxes, BFPO. My first thoughts when the first of the three deliveries arrived was "it's a bit light", not exactly sure what the wood is but at a guess it's pine. Second issue is that some of the plastic bolt cover caps are already attached when shipped, they are proud of the surface so the plastic shipping material is easily damaged and caps lost. Unless I've missed some bolts there do appear to be some extra caps in the bag of fixings. Once assembled, and you can see it in the picture, not exactly flat is it? Lastly, and I only just noticed as I gave the table top surface a wax this morning. When I assembled the table I noticed that the cross beams holding the table top planks together had been attached with a nail gun, possibly by someone with the DTs and that in three places the nails had come through the the table top to penetrate the surface of the table. This is dangerous and lucky I noticed before I use the table with any guests. A hammer should sort them out but will no doubt leave unsightly marks on the table top. 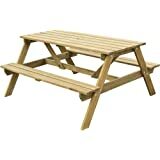 5.0 out of 5 starsA budget bench thats strong and large enough for a family. 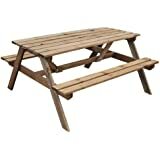 Soft wood bench was reasonably easy to construct even though we tried really hard to find instructions on website. We made a few mistakes as had to build it blindly. Maybe a link to the instruction on product page would help. Timber is splitting in places but to be expected as its a bad summer with soakings and drying out in the heat. Took the weight of 3 very large adults one over 25 stone, 4 kids. It definitely will appreciate a decent oiling before the winter to protect from water. When its been raining it does take a long time to dry out. 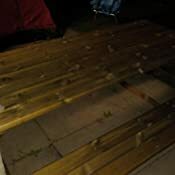 Wood has been pressure treated but that dont stop surface water absorption. Due to this and our terrible weather we only used it a few times :( A damp seat is not nice. Its a screw together construction with hex heads so please get a decent ratchet socket set and extra help. 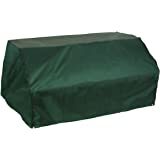 As with all softwood furniture its best to store inside or under cover in UK winters. If you want many years usage it will need regular protective coatings. 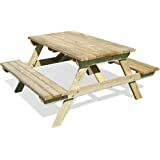 In summary, a cheap and sturdy table that will last quite some time with care. 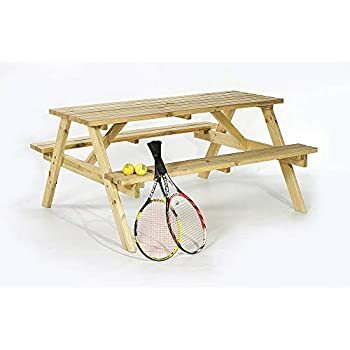 Im sure a hardwood version would be appreciated even if it cost a couple hundred pounds more. Mounted the table on concrete bu t used treated timber under the legs of table to keep the water of them in winter. Makes table a little higher too. 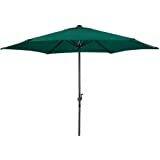 We also asked for no BROLLEY HOLE so pic in this review is of one without the hole that comes as standard. 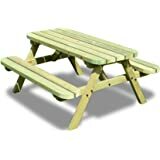 The weight & density of the wood and the quality of the manufacture are unsurpassable. Arrived 2 days earlier than the confirmation e mail said. Good job we were in. 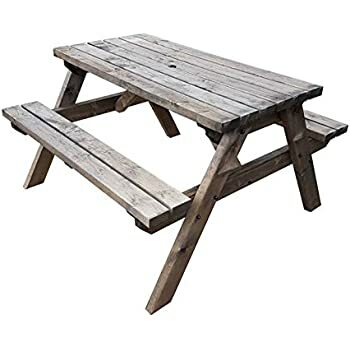 The table top was faulty, all the nails from the underneath support were stuck up. An e mail was sent explaining the problem and was quickly resolved. 2 days later another table top was delivered and was fine. Assembly instructions not great and not as easy as it looks. Once up it’s fine and good quality. 5.0 out of 5 starsWell worth the money picnic bench. A lovely bench. 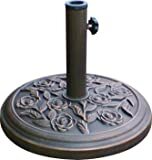 Nice and solid and looks good in the garden with the parasol I bought separately in the middle. 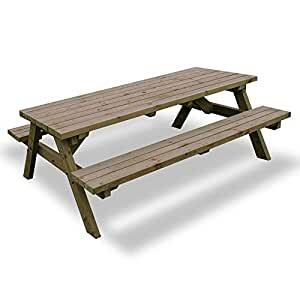 I got a man in to assemble it as I am a bit disabled but it was worth the money. 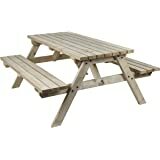 Bought this for the kids who wanted a picnic area at the top of the garden - really nice quality item. 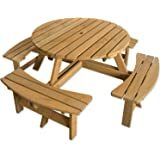 Good solid wood, well finished and easy to put together. Good value and promptly delivered too.